What you're looking at is the first Stanley Cup championship ring, won by George Lowe as a member of the Montreal Amateur Athletic Association way back in 1893. The ring was up for bid as a part of Classic Auctions's 2009 Montreal Canadiens Centennial Auction and bidding ended last night at a whopping $55,612.00, or approximately how much Philadelphia Flyers center Jeff Carter makes a game or the likely the next fine levied to multiple offender Denis Gauthier. 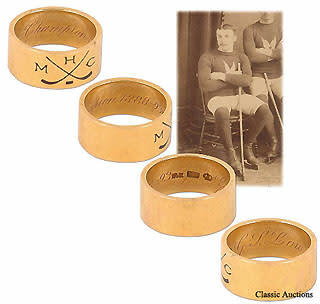 "The simplistic ring is engraved and enameled with crossed hockey sticks and MHC (Montreal Hockey Club) and is identical to the only other known example, presented to player Billy Barlow, on permanent display in the Hockey Hall of Fame in Toronto. Crafted by a local Montreal jeweler (doing business in 1893) as evidenced by the makers hallmark stamped inside with their 15K marking. In addition, the name G.S. Low is inscribed. This undoubtedly refers to the player on the victorious AAA hockey squad in 1893 listed in photographs as G.S. Lowe or George Lowe." Back in 1893, it took the Montreal Hockey Club only seven wins to bring home the Dominion Hockey Challenge Cup (now Stanley Cup). Of course, there was the fact that the teams only played eight games, and the MHC had a 7-1 record, one win better than the Ottawa Hockey Club to claim the title. From the wedding band-looking keepsake given out 116 years ago to the diamond-studded white gold rock now the Detroit Red Wings received over the summer, these championship mementos have evolved a bit. If there's one public service announcement I can make today, it's that you should all check your attics, closets and anywhere else in your home that may be used as a storage location. 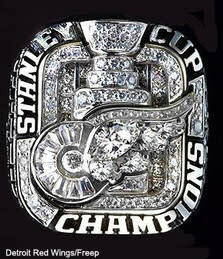 The $55,612 ring was found in the attic of a home in Vancouver. While that Eric Lindros rookie card may not be the solution to your college loans, valuable artifacts are found all the time hidden away next to the oscillating fan and unused "8-minute Abs" videotapes tucked away in homes everywhere.